Gourmia Mini Fridge - Is a Smaller Cooler Better? Gourmia Mini Fridge – Is a Smaller Cooler Better? The Gourmia Mini Fridge works well in situations where you need a compact cooler and you don’t have a lot of drinks or food that you need to chill. In fact, it makes a great single-person cooler. In addition, you can use it as a warmer. Whether you want to keep your lunch warm or are taking a hot dish to a potluck dinner, the Gourmia can help you out. Where Can You Use a Mini Portable Fridge? Lots of places! 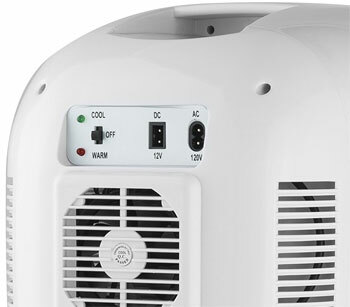 Due to its thermoelectric heating/cooling system, this unit stays very quiet. It also features a self-locking door. Therefore, you can easily use the portable Gourmia fridge anywhere. In fact, people use them in their cars, RV’s and boats as well as at their office desks and dorm rooms. Why is a Mini Fridge Better? Not everyone will agree that smaller is better. However, the advantage of having a mini fridge is that it can cool and warm its contents faster than larger devices. In addition, it takes up less space and is very lightweight. Furthermore, you can get these mini coolers for cheap. As you can see, if you want a personal sized cooler, these smaller units can offer multiple benefits. By the way, you can choose from 2 different sizes: the smaller 9-can version or the larger 12-can version. In either case, these coolers are still fairly small. Cooling Capacity: Cools up to 32°F below ambient temperature. Warming Capacity: Warms up to 150°F in an ambient temperature of 75°F. Includes detachable power cords. Plugs into AC wall outlet or 12V outlet in vehicle. Just like this mini fridge, Gourmia makes an entire line of low-maintenance, ultra convenient small kitchen appliances. They save people time, money and make food prep a whole lot healthier and easier.